Hominidae is a taxonomic family of primates that today is commonly considered to include extant (living) and extinct humans, chimpanzees, gorillas, and orangutans. In this taxonomic scheme, Hominidae is one of two families of apes (superfamily Hominoidea), the other family being Hylobatidae (the gibbons). Members of Hominidae (sometimes exclusive of humans) are known as the "great apes," while members of Hylobatidae are known as the "lesser apes." However, historically, and even in some current taxonomic schemes, Hominidae included only humans and their close extinct relatives (eg., Australopithecines, Neanderthals)—that is, those more closely related to humans than the other great apes, which were in a different family. The use of the term hominid, which is the designation for members of Hominidae, reflects these two meanings. In a technical and growing sense, it refers to humans, chimpanzees, gorillas, and orangutans and their extinct relatives. However, also common, particularly in anthropology, is to see hominids refer only to humans and their extinct forebears, both because of historical tradition and because of taxonomies in which humans are the only extant species in Hominidae. The historical view of humans as unique from the rest of living organisms has gradually been eroded, culminating with the placement of humans together with the great apes in the same family Hominidae, on the basis of quite similar morphological and genetic characteristics. There are even proposals to place gorillas and chimpanzees together with humans in the Homo genus and to consider great apes as "persons." Indeed, chimpanzees and humans share more than 98 percent genetic similarity. However, when other factors are considered, the gap between humans and the rest of living organisms, including primates, is great indeed. Only humans have complex language using syntax and grammar, complex social systems (forms of government, etc. ), and complex technologies ( computers, satellites, etc.). Human creativity is such that people even develop new varieties of plants and breeds of animals. The classification of Hominidae has been revised several times in the last few decades. Originally, Hominidae included only humans and their extinct relatives, with all other apes being placed in a separate family, the Pongidae (Simpson 1945). In the 1960s, utilizing techniques from molecular biology, the lesser apes were moved into their own family (Hylobatidae), with humans remaining in Hominidae, and the non-human great apes remaining in Pongidae. Eventually, the other great apes (gorillas, orangutans, and chimpanzees) were placed into the family Hominidae along with humans, by demoting the Pongidae to a subfamily. Subsequently, it was decided that the African apes (chimpanzees and gorillas) were more closely related to each other than any of them are related to the organgutans, and the chimpanzees and gorillas were moved into the subfamily Homininae with humans, with orangutans remaining in the subfamily Pongidae. Chimpanzees and humans were further separated into the same tribe, Hominini, and humans and their extinct relatives further separated into the sub-tribe Hominina. A hominid is a member of the family Hominidae: All of the great apes, including humans. 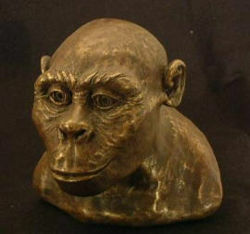 A hominan is a member of the sub-tribe Hominina: Humans and their extinct relatives. However, universal acceptance of this taxonomy of Hominidae is lacking and thus affecting the consensus of the term "Hominid." Certain characteristics are still used by some systematics to support the idea that hominid should only denote humans and human ancestors. Some taxonomies place gorillas and chimpanzees (and the related bonobos) into the Panidae family, while orangutans remain in the Pongidae family, and humans in the Hominidae. Others continue to list only humans as hominids, and use a separate family, Pongidae, for great apes. As noted above, anthropologists commonly use the term hominid to refer only to humans and their direct and near-direct ancestors, based on many decades of use where hominid was used in that narrow sense. On the other hand, some researchers go so far as to include chimpanzees and gorillas in the genus Homo along with humans, though this is uncommon. Many extinct hominids (in the more inclusive sense) have been studied to help understand the relationship between modern humans and the other extant hominids. Some of the extinct members of this family include Gigantopithecus, Orrorin, Ardipithecus, Kenyanthropus, and the australopithecines Australopithecus and Paranthropus. Goodman, M. 1963. Man’s place in the phylogeny of the primates as reflected in serum proteins. In S. L. Washburn, Classification and human evolution. Chicago: Aldine. Goodman, M. 1974. Biochemical evidence on hominid phylogeny. Annual Review of Anthropology 3: 203–228. Goodman, M., D. A. Tagle, D. H. Fitch, W. Bailey, J. Czelusniak, B. F. Koop, P. Benson, and J. L. Slightom. 1990. Primate evolution at the DNA level and a classification of hominoids. Journal of Molecular Evolution 30: 260–266. Simpson, G. G. 1945. The principles of classification and a classification of mammals. Bulletin of the American Museum of Natural History 85: 1–350. This page was last modified on 29 August 2008, at 14:16.